How to do an NMAP scan on Armitage to find IPs within a certain range. I have had many times where I have to do this command or Armitage wont start due to many errors. So don't risk it. -Next, you want to open up Armitage. On Kali 2.0, Armitage will be on the left side tool-bar, and on Ubuntu, it will be on the left tool-bar also. So just click it once. If you aren't on either of those, you may want to look into how to start Armitage. -This window will pop up, and unless you want to get advanced, Which I don't in this tutorial, just leave it at default. -Next, this window will probably pop-up. As far as i know, It doesn't matter if it does or doesn't pop-up for you, as Armitage usually knows whats going on, so just press 'Yes'. -Armitage will load up, and start. Don't worry when in the loading window, it says 'connection refused'. That happens every time. 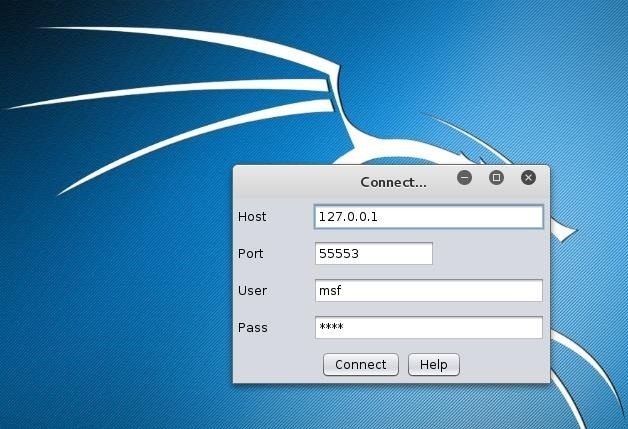 -Nmap will start scanning for IPs on your network in the console at the lower half of the window. -You will eventually get something that looks a little like this in the top right of your window. -To attack a computer, well frankly thats a whole other topic. (again) I will touch on that in a later post. -If you get no results from the scan, you may want to try a different IP range. All networks can be different when it comes to IPs. -If your loading stops, usually it will show you a reason for it, and how to fix it, but try restarting postgresql. --I will expand upon this as I get suggestions. Please be nice as this is my first post on NullByte. Thank you for reading my fellow White-Hats! Good first post , Cameron.